As you may know, yours truly is from England, and though I deeply love living in New York, from time to time I glance over my shoulder to see what I’m missing. Brexit isn’t one of them, but Otter Surfboards most certainly is. 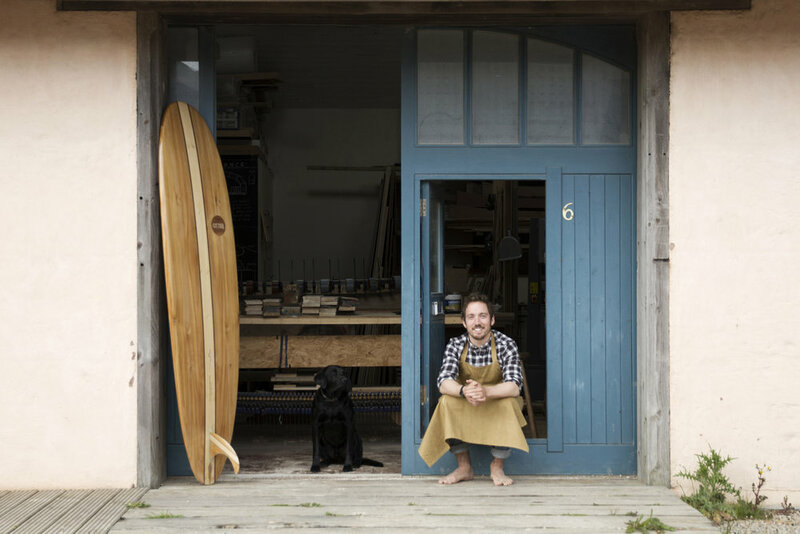 We recently caught up with Otter Surfboards founder, James Otter, to find out more about his wooden surfboard company. Otter descends from a family of farmers and carpenters, so if there’s a gene for finding pleasure in working with your hands, Otter almost certainly has it. Growing up connected with the land and with craftsmanship Otter went on to attended one of England’s more outdoorsy, coastal universities, Plymouth. It was here that the idea of building wooden surfboards first struck. Ice Cream Headaches: Tell us about the genesis of Otter Surfboards - where did the idea come from? 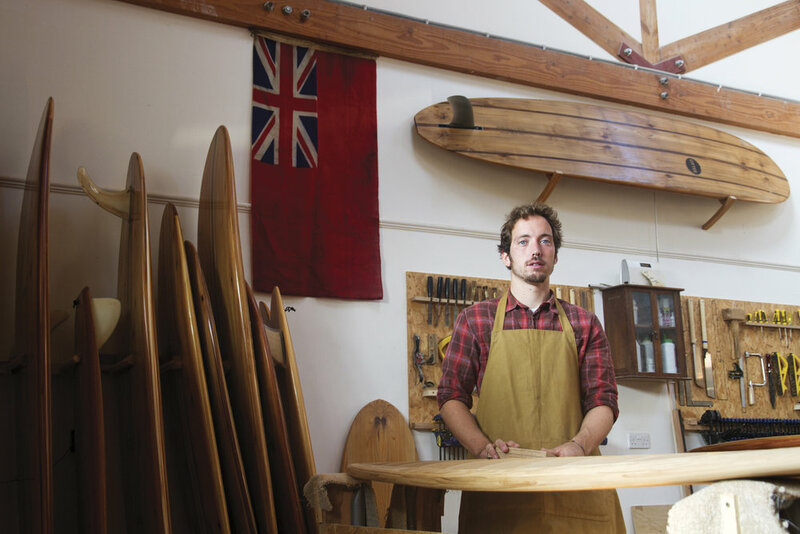 James Otter: The thought of making my first wooden board actually came from a magazine: The Surfer's Path. I was studying furniture making, heading into my final year and through the summer break they ran an issue called 'The Wood Issue', which exposed me to a whole world of wooden surfboard makers. I loved the idea of it, so began working out how to use local timber to make surfboards. After two years of experimenting, I got to a point where I was happy with the boards and started working out how to sell them. ICH: Did you know right away that you could make it work, or were you considering other paths at the time? JO: I definitely didn't know if it would work, but I was young, so didn't have any financial commitments or dependants, and I had the 'If not now, when?' question rattling round my head. So I jumped into it and gave it all the energy I had. Luckily I've had such supportive friends and family that are still by my side to this day, who have helped make it all possible. ICH: You've said in previous interviews that you were surprised and very happy to discover that teaching people how to make these boards was almost as fulfilling as making them yourself. What is it about teaching, or the combination of teaching and making, that’s so satisfying? JO: By teaching people to make things, you open them up to what they are capable of doing with their own two hands. It gives them such belief and confidence that you can't help but smile. Today, not many people stop and take the time to make anything, let alone something they plan on playing with in the ocean, so the excitement and anticipation that rattles round the workshop during our courses is just magical. ICH: What's the hardest thing about running this company? JO: For me, it's simply the ambiguity of it all. We never know when the next order might land in our inbox, which leads to some pretty lean months, even years, which can be tricky to deal with. Although we definitely aren't in this to make lots of money (I think that would be incredibly hard), we do need to make enough to keep going, and that can be challenging at times. Luckily, after 8 years’ running the company, we're still here and still smiling. It still doesn't feel like a 'real job', hanging out with friends, laughing and surfing for most of our waking hours. ICH: For people who are deeply attached to surfing, but who’ve never tried a wooden board, what would you say to convince them to give it a go? JO: I know for a fact that it isn't for everyone, but for those with an open mind it can transform your surfing. Our boards finish about 25% heavier than a typical foam board. They have momentum and carry speed, so they really suit big, smooth turns and flowing lines. 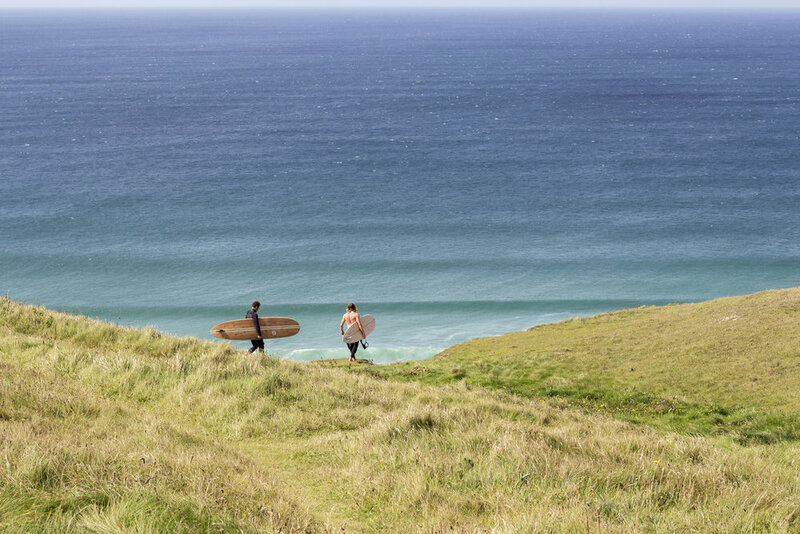 If that's the kind of surfing you aspire to, then they could be just what you're looking for. Also, knowing exactly how they are made and what they are made from - literally being able to see where the trees once stood - is a big plus side for us. We make our boards to the absolute best of our abilities and know they will last decades, all of which contributes to better care for our planet. ICH: How important are partnerships with other brands or sponsored surfers in spreading the word about your work and your boards? JO: We love working with like minded people, companies and charities. It's a way to elevate what we do and expose ourselves to new audiences, so it works really well as a way of getting our name out there. It's also one of the most enjoyable parts of the job because each new partnership or project demands creativity and a new story. ICH: Is there any surfboard technology you're aware of, or following, that you believe could make a meaningful dent in the environmental impact of mainstream surfboard manufacturing, and what are the barriers to wood as a material playing a bigger role in the industry? JO: I think there are several that are interesting to keep an eye on, but it's a tricky question because most of them are still based on a very capitalist attitude of selling more products to make more money. It's really encouraging that you have larger manufacturers trying out new materials and manufacturing processes to try to make boards more sustainable, but there is also a heck of a lot of miscommunication and green-washing. The big manufacturers still, ultimately, rely on selling a huge volume of products to make their businesses viable. We focus on doing the least amount of harm we can and making the best product we can, but above all for us, we are building a community of like-minded individuals who will make real changes in their local communities. We can all make a difference. ICH: What is your vision for Otter Surfboards in the long term - do you plan to keep growing organically, or are there other plans for growth or diversifying on the horizon? JO: There are some fairly natural progressions for us, but we enjoy doing what we do so much that it's mostly about the preservation of that. It's funny, we got together a few years ago as a team and decided that growth for us doesn’t mean chasing targets for more customers and more sales. Instead, it’s about finding ways to improve our customer's experiences, add more value to the surfboards and our care for people. We've got a few projects and plans up our sleeve, but ultimately we're keen to keep doing what we already do. When you have customers that make positive, life-changing decisions off the back of their experiences with you, it feels like we could hang up our tools tomorrow and be more than happy with how we’ve affected the world around us. We’d like to thank James Otter and photographer Mat Arney, for their time. Check out Otter Surfboards at their website here. For news, action and offers, follow Ice Cream Headaches on Instagram here. Subscribe for news and offers! We’ve featured the work of up-and-coming New Jersey photographer Fiona Mullen before, but after seeing glimpses of her new portfolio of work from trips to Indonesia and Australia, we felt now would be a good time for a proper chat. ICH: Tell us about your trip to Indonesia - who did you go with and why? Fiona: I first visited Bali in November 2016 - a short 10 day trip to Indonesia that had me itching to go back. This summer I traveled to Australia for an internship with The Mermaid Society, but I decided to dedicate the whole of May to a surf trip beforehand. I wanted to be somewhere close to Australia and cheap to live. Indonesia was the best option. I had no luck finding a surf camp to have me stay as a photographer, so I chose the comfortable route and decided to go back to Bali for the month. I met up with my friend Karson Lewis, who is a longboarder, on an island off Bali. It was nice to spend time with a fellow longboarder and photograph my favorite style of surfing. The trip was intended to be purely for surfing, but while I was there it seemed like we had days on end of flatness or well overhead swells that were more suitable for shooting. I had some seriously humbling swims on this trip! I also spent time battling crowds, dealing with bali belly, allergic reactions, and all the other unpleasant things that come with third world travel. I now have a love/hate relationship with Bali. The place has changed so much even within the two years since I last went. The crowds are worse, the trash is worse, the traffic is worse, and I cannot see how the place is going to improve with the constant build-up in an already-crumbling infrastructure. Bali is an experience to say the least. So, what was the inspiring moment of the trip? The most inspiring moment was swimming at Uluwatu. I surfed it when it was smaller a few days prior, but it was a whole different beast on this day. I made the long walk down the cliff, through all the restaurants and shops with my housing and fins in hand. I swam while my friend Jake paddled out. Swimming out wasn't bad, but as the tide filled in the sets just got bigger and bigger. Lots of Brazilians, a few locals and others filled the lineup. A lot of guys come up to me and ask for my name and info to buy photos if I got a shot of them. I love people's reaction when I tell them I'm from New Jersey. It’s always a shock to people. Swimming back in was the sketchiest part, getting swept so fast down the sides of the cliffs and timing my exit through the keyhole before I got swept past it to the next beach, which is a long way down! It was a magical morning. I found out the evening before that session that my grandma had passed away. She had been battling cancer for a year, and I was sad to not be home with my family. The last time I saw her, I was telling her about my upcoming trip to Bali and Australia. I swam out at Uluwatu the next morning, just as the sun was coming up. The whole session switched between sun and rain showers. I came out without a scratch, getting some of the most rewarding photos of my life. That sounds amazing! For you, what’s the most enjoyable part of your creative process? The most enjoyable part of photography for me is that you have these unexpected moments. I feel when I force my photography, it's never enjoyable. I hate planning things - it never feels as genuine. On this trip there were various days where I had no plan on shooting, but the stars aligned and the waves ended up being too perfect for me not to swim out. Surf photography can be repetitive, and there are so many people that do it these days, but I have learned that keeping my passion for it alive consists of not comparing my work to others’. Despite the current over-saturation of surf photography, I’m always thinking of ways to create something new and personal to me: I don't want the excitement of shooting surf to dwindle anytime soon! How come you decided to study PR & journalism at Monmouth, rather than photography? I started off planning to major in art with a concentration in photography, but I found it too fine art based for my liking. I felt like photography was something I needed to pursue on my own time instead of studying. Public relations and journalism seemed like the most compatible with what I was doing with my photography. I’m constantly collaborating with other artists or companies, and having to write, so a communications degree seemed like the best fit for me. Monmouth is a beautiful campus - just a mile from the beach, allowing me to pursue what I love while studying! Can you tell us about any barriers you’ve had to overcome to pursue photography? Being taken seriously as a young female photographer was hard. When I was 17-18 years old it was difficult to find ways to take photos and still make money. Starting out with photographing friends is great, but it could only take me so far. I’ve learned how to stand up for myself and not be taken advantage of. Doing work for exposure is always great, but it makes me happy when people see the value in my work and trust me to do photography work for a company or whatever it may be. You can't break into photography by giving away photographs; there has to be a balance between taking photos for your personal portfolio and photographing professionally. I am still learning all of this. Yes - it’s a steep learning curve! You’ve often focused on coastal communities and surf culture. 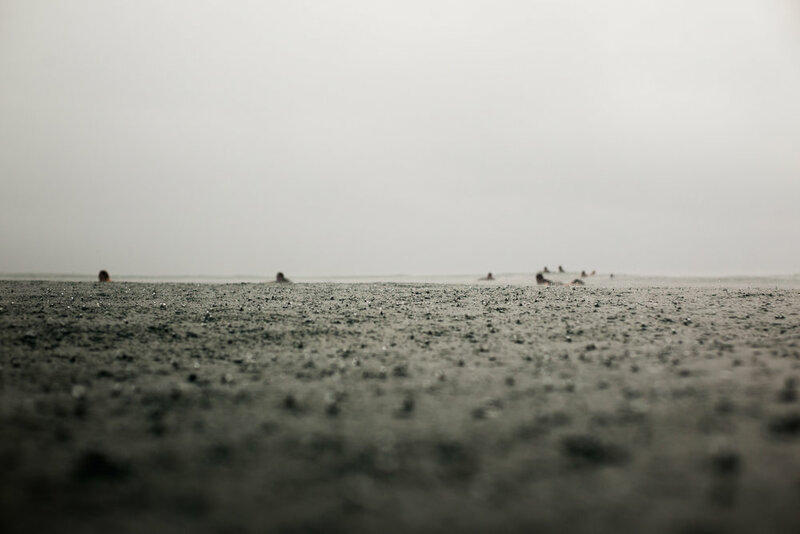 What do you find compelling about the ocean and surfing as a subject matter? 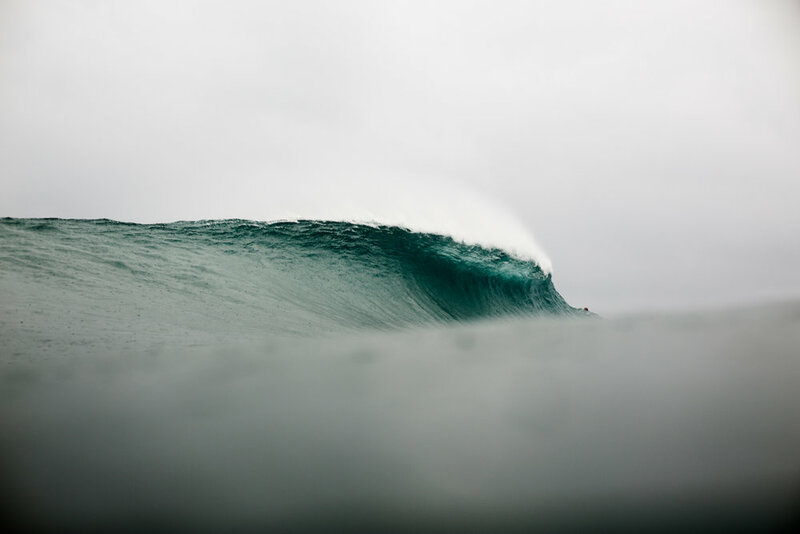 My time in Australia and New Zealand this summer reminded me why I spend so much of my time, money, and creative effort photographing surfing. I like to stay true to what I love and the water is where my mind is, so my photos reflect that. For my internship with The Mermaid Society, I lived with Sally (the founder) and her family after only meeting through FaceTime calls. It worked out perfectly. I had always dreamed of traveling to this end of the world, where surfers and ocean-minded people make up such a big chunk of the population. 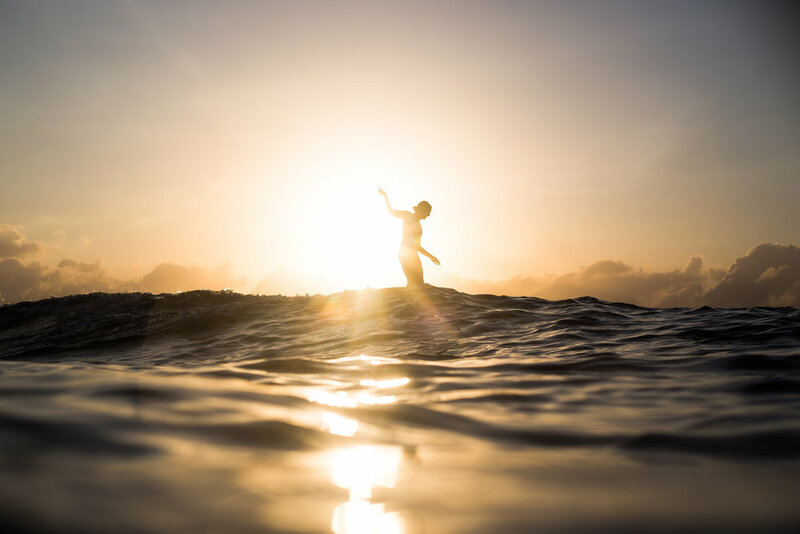 Coming from the northeastern US, where surfing year-round is almost unheard of to the average person, it was pretty cool how so many Australians prioritize surfing and time spent in the ocean in their lives. New Zealand was a quick solo mission - I rented a car and drove around the majority of the north island in a week. The place seems so raw and geographically distant from the rest of the world. The feeling is hard to explain, and I tried to capture that in the photos I was taking there. So, what's the next big adventure you're planning and what would be a dream photo to come back with? After doing a sailing trip in Australia, I am eager to get on a boat again. I am currently reading Swell by Liz Clark and it is really making me want to hop on a boat somewhere off Mexico and sail down the coast. I’m dreaming of a photograph that encompasses everything great about the combination of surfing and sailing! Big thanks to Fiona for her time and the photos she shared with us here. To support her work, check out the new print store on her site!